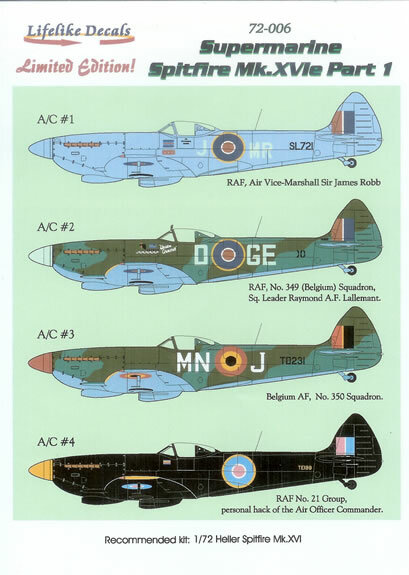 Decals for four subjects in each case, with colour-printed painting and markings guide. 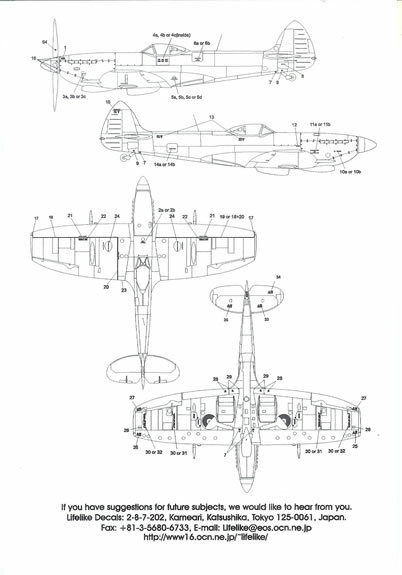 The Spitfire is undoubtedly one of the most popular aircraft modelling subjects ever, and needs no introduction or description here. Suffice to say; of its many marks and versions, one of the lesser-seen in model form is the Mk XVI low back with bubble canopy. 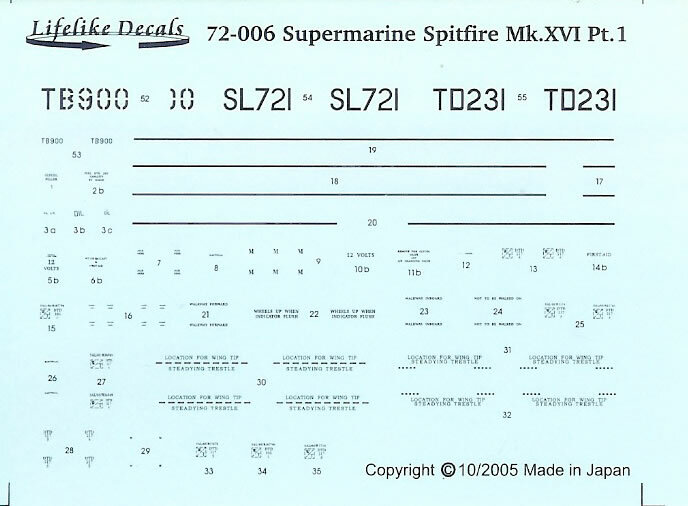 So it was with interest that I received two re-issued sets by Lifelike Decals for the Spitfire Mk XVIe. For a long time the only 1/72 Mk XVIe was a quite nice kit by Heller. Matchbox also issued a kit which was fairly typical of the brand, and it’s not often seen these days. 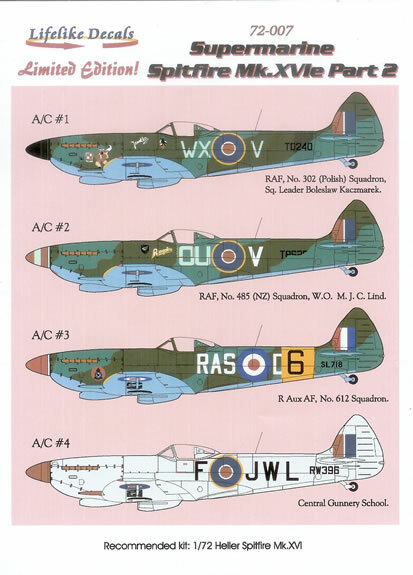 Then two or three years ago CMR began kitting late twin-stage Merlin-engined Spitfires which included the low-back Mk XVIe, which at the time of writing is still the definitive 1/72 kit of this version in my opinion. The decals come in the ubiquitous A5-sized zip-lock bag with and folded A4 pages for instructions. These are very nicely printed in colour and include a paragraph describing each scheme, including the colours applicable. A further ½ page serves to guide stencil placement. 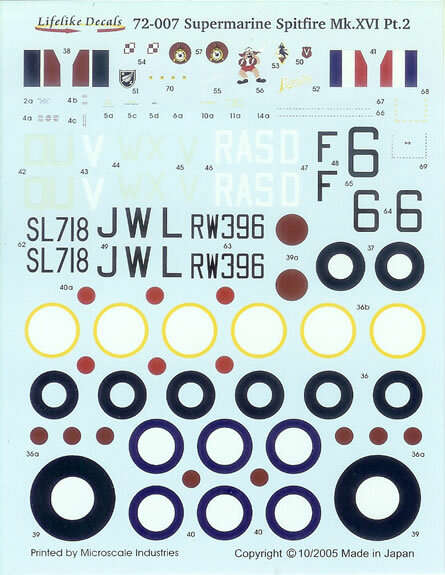 It’s pleasing that there are sufficient national insignia and stencils to allow all of the schemes to be modeled. 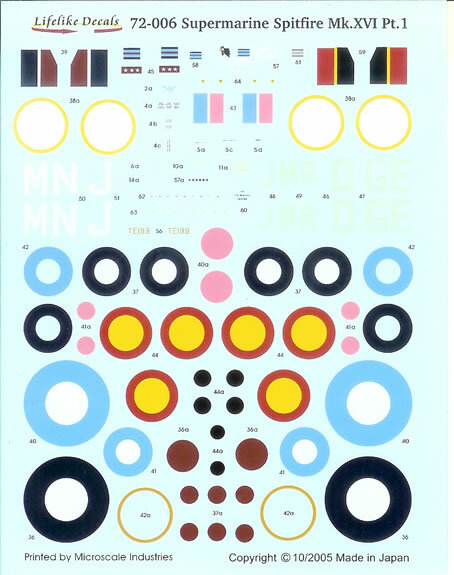 The decals themselves look to be superbly printed and with good colour density. The selection of schemes will I think prove popular as both plenty of colour and some unusual finishes are offered (especially Part 1 with its overall powder-blue and black options). The camouflage options are brightened by coloured spinners, artwork and in one case an orange fuselage band. Thanks to Lifelike Decals for these samples..